Millions of movies have been made over the years, but few have houses that will forever be remembered. 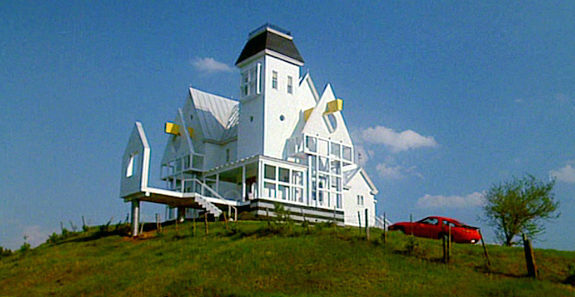 We all remember the "Bates Motel" from Psycho and the "Maitland House" from Beetlejuice but most iconic movie houses are fabricated. The original design for the Psycho house was inspired by Edward Hopper's "The House by the Railroad" painting, but I believe there are so many existing houses across the country with interesting design. I recently visited the "Hewitt House" from The Texas Chainsaw Massacre remakes. This is an actual home, in Granger, TX. The massive house with six dirty pillars casts huge shadows across the Texas land. How they found this house is unknown, but even if a horror movie wasn't filmed here, it naturally screams creepy. To this day I think this house is creepier than the original TCM house. And with the original house remodeled and turned into a restaurant, I feel the original lost some of it's Horror Movie mystique. Where as the Hewitt house in Granger, TX retains it's erie vibe down to the filthy pillars and balcony. Not to mention the creepy residents who live in this area, The Hewitt house with it's big, cold, simple design has proven to be a memorable piece of horror movie history. The start of a new year had been great until I woke up one morning with Iritis late January. It started in my left eye and four days later it was both eyes. My eyes were red, I had ocular pain, and my vision was very blurry. I received treatment at Buena Vista Optical, great staff and Dr. Richard Gillette is the best. After numerous eye drops and creams, i'm finally back catching up on AMS orders. I apologize for the delay to everyone, if there are any questions please email me at Info@ambermediasolutions.com.